The groups of Phrygian tumuli in Ankara and its vicinity have attracted the attention of archaeologists since the 19th century (Chantre, E. 1893: 68). According to the research, tumuli of the Phrygian Age in Ankara date to between the 8th and 6th centuries BC. 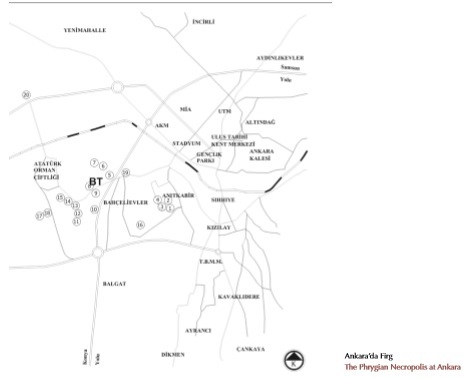 One a significant necropolis area was located to the southwest of Ankara Castle and Ulus, and another in the area between Atatürk Orman Çiftliği and Anıttepe-Bahçelievler (Figure……).The METU Phrygian Necropolis Project is able to establish that, including those described byThompson, a total of 20 tumuli have been recorded (Thompson, R.C. 1910: 8; Buluç, S. 1979: 1-8). Three of the tumuli (GreatTumulus,Tumulus I,Tumulus II) were excavated within the METU Phrygian Necropolis Project in 1967 (Buluç, S. 1979: 12-24). In the cremation area on the southeast of Beştepeler Gençlerbirliği Tumulus, archaeological intact deposits exposed during the construction of Gençlerbirliği Sports Facilities, salvage excavations were carried out by METU and Ankara Anatolian Civilizations Museum between 1986-1988 (Buluç, S. 1993: 83-95).